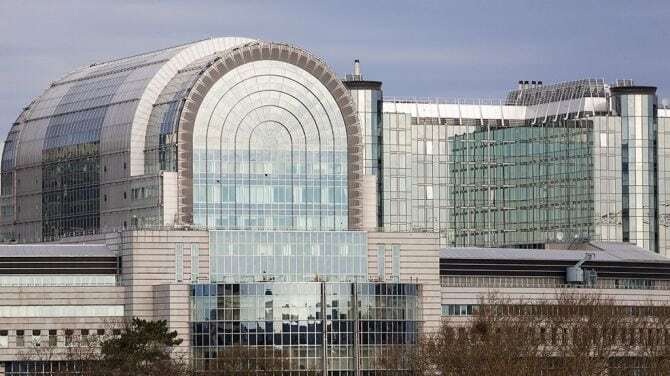 Three issues featured strongly in the Press Seminar organised by the Association of European Journalists which took place at the European Parliament in Brussels on June 26th and 27th , immediately prior to the latest EU Summit. They were: Brexit, immigration and press freedom. Sadly, AEJ President Otmar Lahodynsky was unable to attend because of an accident in Berlin which left him restricted in travel options. However, he did address the seminar by video from his hospital bed and wished us the very best for our two-day meeting. A special session was held to discuss the looming departure of the United Kingdom from the European Union. This is, of course, one of the most significant developments of recent times and the implications for Ireland and the border between the two parts of our island have become a critical item in the negotiations for withdrawal. The panel for the discussion included Dublin MEP Brian Hayes who pointed out that there is currently no physical manifestation of the border between north and south and that everyone is anxious to avoid returning to the controls that existed in the past. He pointed to the “backstop” undertaking in Paragraph 49 of last December’s Joint Report by the EU and UK negotiators, whereby Britain reiterated its guarantee of avoiding a “hard border”. He believes the Brexit standoff is “undermining the peace process” in Northern Ireland. “The Irish Government is very clear there will not be a withdrawal agreement until this matter is resolved by the British Government,” Mr Hayes said. With Austria about to take over the Presidency of the Council of the European Union, Ambassador Gregor Schusterschitz said that “twenty per cent” of the withdrawal agreement still had to be negotiated with the UK. The Ambassador, who is a member of the Brexit Working Group of the European Council , said the pace had “considerably slowed down” and there wasn’t “the same dynamic as before”. President of the European Parliament, Antonio Tajani, in a brief address to the Seminar highlighted the issues of immigration and Brexit. He said immigration was posing a “very dangerous problem” for European unity. On Brexit, he said it was “a mistake” for the United Kingdom to leave the European Union but he pointed out that the UK was not leaving Europe and it was important to have good relations in the future. “We do not know what they want to do, what agreement they want to achieve with us. We are in the hands of the unionists of Northern Ireland, they will decide the UK position ,” he added. There was a special session under the heading “Attacks on Journalists and Press Freedom in the EU”. By coincidence, it took place on the 22nd anniversary of the murder of Irish journalist Veronica Guerin on June 26th 1996. It was clear from the discussion that major issues of personal security still remain for journalists who are investigating crime. The brutal killing of Maltese journalist Daphne Anna Caruana Galizia in a car bomb last October was mentioned as a recent example. The right of journalists to carry out their investigative work without facing threats to their personal security is an issue which must continue to be highlighted and vigorously pursued by organisations such as the AEJ.